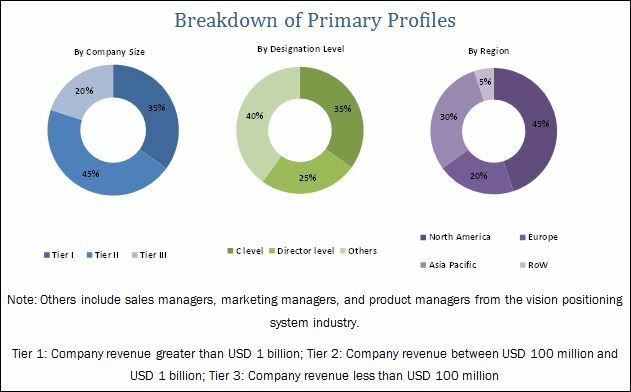 [185 Pages Report] The vision positioning system market is projected to grow from USD 5.58 Billion in 2017 to USD 9.25 Billion in 2022, at a CAGR of 10.65% during the forecast period. The base year considered for the study is 2016 and the forecast period is from 2017 to 2022. The report analyzes the market on the basis of component (sensors, camera systems, markers, and others), location (indoor positioning system and outdoor positioning system), solution (tracking, navigation, analytics, industrial solutions, and others), platform (unmanned aerial vehicle – drones, automated guided vehicle, robotics, autonomous undersea vehicles, space vehicles), and application (commercial and defense) and maps these segments and subsegments across major regions worldwide, namely, North America, Europe, Asia-Pacific, Middle East, and Rest of the World. The report provides in-depth market intelligence regarding vision positioning system market dynamics and major factors that influence the growth of the market (drivers, restraints, opportunities, and industry-specific challenges), along with an analysis of micromarkets with respect to individual growth trends, prospects, and their contribution to the overall market. The report also covers competitive developments such as long-term contracts, joint ventures, mergers, new product launches and developments, and research & development activities in the vision positioning system market, in addition to business and corporate strategies adopted by the key players in the market. Market size estimations for various segments and subsegments of the vision positioning system market were arrived at through extensive secondary research and government sources such as company website; corporate filings such as annual reports of the leading players, investor presentations, and financial statements; and trade, business, and professional associations such as Australian Association for Unmanned Systems and Unmanned Aerial Vehicle Systems Association, Los Angeles, among others. Furthermore, corroboration with primaries and further market triangulation with the help of statistical techniques using econometric tools was carried out. All percentage shares, splits, and breakdowns were determined using secondary sources and verified through primary sources. All possible parameters that affect the market covered in this research study were accounted for, viewed in extensive detail, verified through primary research, and analyzed to obtain the final quantitative and qualitative data. This data is consolidated, and added with detailed inputs and analysis from MarketsandMarkets, and presented in this report. 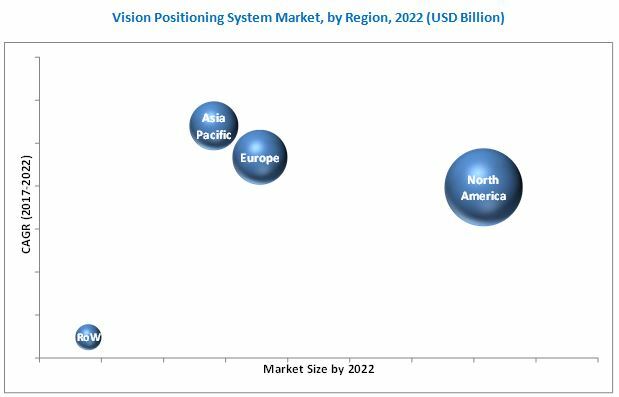 The ecosystem of the vision positioning system market comprises manufacturers, distributors, and end users. Key end users of the market are commercial and defense sectors. Key players in the market are DJI (China), Sick AG (Germany), ABB (Switzerland), Cognex Corporation (U.S.), and Omron Corporation (Japan) offering advanced technology systems, products, and services. These players are adopting strategies such as agreements and partnerships, new product developments, contracts, and business expansions to strengthen their position in the market. The vision positioning system market is projected to grow from USD 5.58 Billion in 2017 to USD 9.25 Billion by 2022, at a CAGR of 10.65% during the forecast period. Vision positioning systems provide real-time information about the surroundings in which they are installed. Factors such as growth in usage of indoor and outdoor positioning system as well as increasing industrial automation for efficiency and lower operating expenses are driving the growth of the market. Vision positioning systems consists of various components such as sensors, camera systems, markers, and other electronic components. These components are used to carry out various tasks. Camera systems is the largest and fastest-growing component subsegment of the market. The market is segmented based on location of implementation into indoor and outdoor environment. Indoor systems are used in factories, indoor warehousing, and indoor navigation, among others. Outdoor systems are used for outdoor mapping, warehousing in container depots, drones, and military robotics. Indoor segment is the largest segment for market, by location. Based on application, the market has been segmented into commercial and defense. The commercial segment is projected to grow at the highest CAGR during the forecast period of 2017 to 2022. The demand from commercial applications is due to the rise in industrial automation in logistics & warehouse management. Other commercial applications include healthcare and navigation in retail stores. Drone based vision positioning systems are increasingly being used in media & entertainment and security applications. Vision positioning systems are installed on UAV drones, automated guided vehicles, robotics, automated undersea vehicles, space vehicles, and other platforms. The robotics and automated guided vehicles segment is the largest platform segment of the vision positioning system market. In this platform, vision positioning systems are extensively used in manufacturing and warehouse management. The UAV drones are used for surveillance and location mapping. Drones are also used extensively in commercial and defense applications. Autonomous undersea vehicles are an emerging platform for vision positioning systems. They are used for deep sea exploration and surveillance to depths where manned vehicles are dangerous to operate or unable to operate due to design limitations. UAV drone is the largest platform for vision positioning systems. Based on solution, the vision positioning system market is segmented into tracking, navigation, analytics, industrial solutions, and others. Industrial solutions is the largest solution segment for vision positioning systems due to the rapid growth in industrial automation. Analytics and navigation solutions are widely used in healthcare and retail sectors to manage these places using big data. Government regulations are a hurdle for use of drone platforms in civilian aerospace. Their widespread usage has led to privacy, security, and safety related issues. Many countries have banned usage of drones without registration. Key players profiled in the vision positioning system market report are DJI (China), ABB (Switzerland), Sick AG (Germany), Cognex Corporation (U.S.), Omron Corporation (Japan), FANUC Corporation (Japan), Seegrid Corporation (U.S.), and Senion AB (Sweden), among others. Contracts is the major growth strategy adopted by the top market players to strengthen their position in the market. 14.12 Adtech (Shenzhen) Technology Co., Ltd.